For years I’ve wanted to learn photography. I always thought I’d buy a DSLR and maybe even take some classes. In fact, ten years ago I saved and spent a lot of money to buy my first digital camera: a Canon PowerShot S1 IS. I was very excited! With camera in hand, I proceeded to explore the world of photography! Then, two years later when my Canon became old technology, I lost all my enthusiasm for photography. I just couldn’t afford to buy another expensive camera and have it become obsolete a few years later. So, broke and broken-hearted, I shelved my dream and moved on. It wasn’t until I got my first iPhone that I rediscovered the joy of photography. Camera apps like Hipstamatic and Instagram made taking pictures fun again! I fell in love with retro filters and wanted more! At about the same time, I started to discover that those apps and their filters simply mimicked what had been done in camera for years with film. The more I played with filters, the more intrigued I became with film. And then eighteen months ago, I bought a film camera. Largely on a whim, I bought an Olympus Trip 35 on Etsy. And that was the start of an obsession. #1. 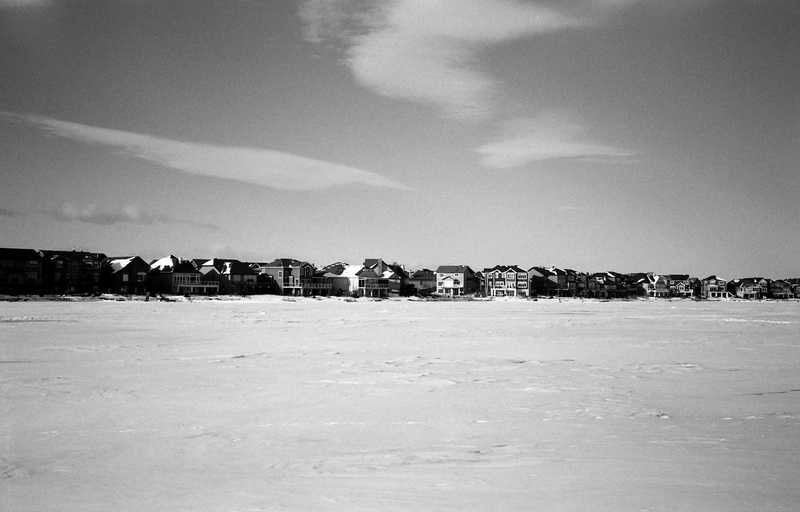 My first photo: the view across a frozen lake. Ilford Delta 100, Olympus Trip 35. And now, eighteen months and 75 rolls of film later, I am starting this photo blog as a way to record my obsession with film photography as much as to share it with you. A photograph may be worth a thousand words, but a photograph not shared, only speaks silence. Hopefully, my obsession helps ignite your own.